November 15 marks the day internationally commemorating my inspirational childhood hero, Steve Irwin. The impact that Steve Irwin, the Crocodile Hunter, has had on my life and this world carries to this day. His dedication not only to the conservation and protection of wildlife and diverse ecosystems, but also to the education of people like myself, marks his contribution to the world's ecological knowledge. Steve once said, "I believe that education is all about being excited about something. Seeing passion and enthusiasm helps push an educational message." His legacy is clear when his own children, Bindi Sue and Robert Clarence Irwin, and his partner and wife, Terri Irwin, carry forward his memories every day. Through their continued work with wildlife conservation and education, the Irwin family has maintained Steve's love for the promotion of environmentalism through building passion. I was sitting next to my parents while we watched the news anchor report the death of my most dear hero in the September of 2006. He had passed away after being pierced in the heart by a stingray that he was filming. I had just begun the fifth grade and had tunnel-vision regarding my future. Because of my own love for animals and ecology, fueled and ignited by Steve, I was determined to become a veterinarian. The Crocodile Hunter was, at that point, a religious experience for me, at least in the consistency with which I watched each episode. My parents saw changes in the contents of my bookshelves as most of my collection became about animals. I had developed a life's passion at the age of 10 because of Steve Irwin and what he brought out of me. It physically hurt to know that he had passed away. My parents remembered that I was disturbed for quite a few days afterwards, even after I had cried that day. The key piece, the inspiration behind my dream, was gone. There were memorials internationally for him, especially in the Australia Zoo which the Irwin family owns. Even though I still was determined to work in a way that helped animals, I didn't know how to move on. What I finally came around to understanding, with the help of my parents, my teacher, and Animal Planet, was that Steve Irwin lived and died doing his life's work -- educating the world about the world's creatures. He had even foreshadowed his own determination -- "I have no fear of losing my life - if I have to save a koala or a crocodile or a kangaroo or a snake, mate, I will save it." 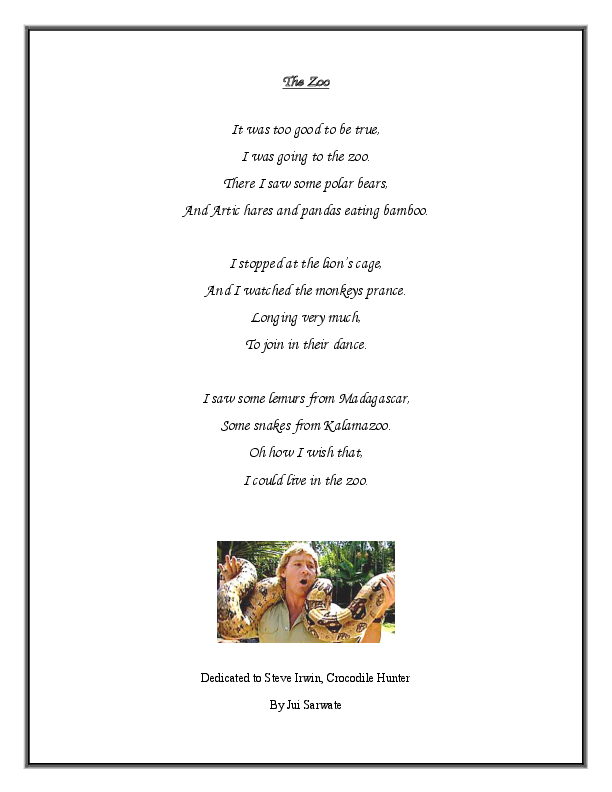 It was this realization that inspired me to write a poem dedicated to Steve Irwin that I titled The Zoo. I worked hard on my beat and did research on different animals before I decided on the perfect words that expressed what I was feeling. This Steve Irwin Day I remember one of my most prominent educators who served as a role model for me long after his own life. He taught me to learn passionately and always live loving what I do. After he passed on, he taught me to process grief and mourn, and then channel my own passions towards creating something that I still treasure to this day.